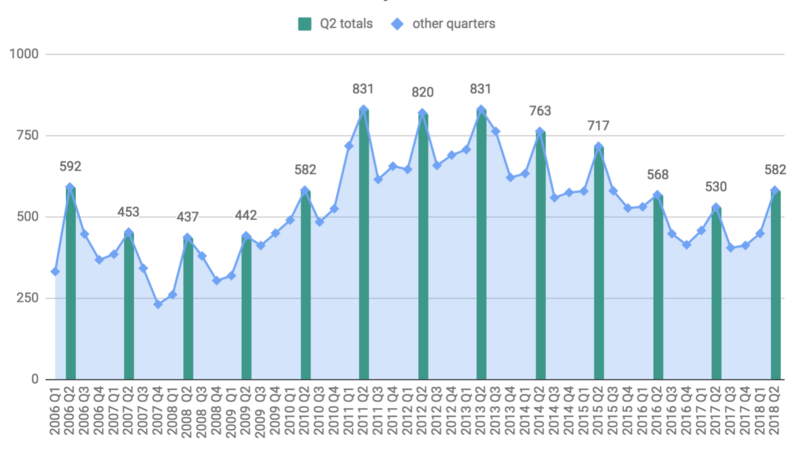 Record level of transactions in Q2 2018.
well below 2011. 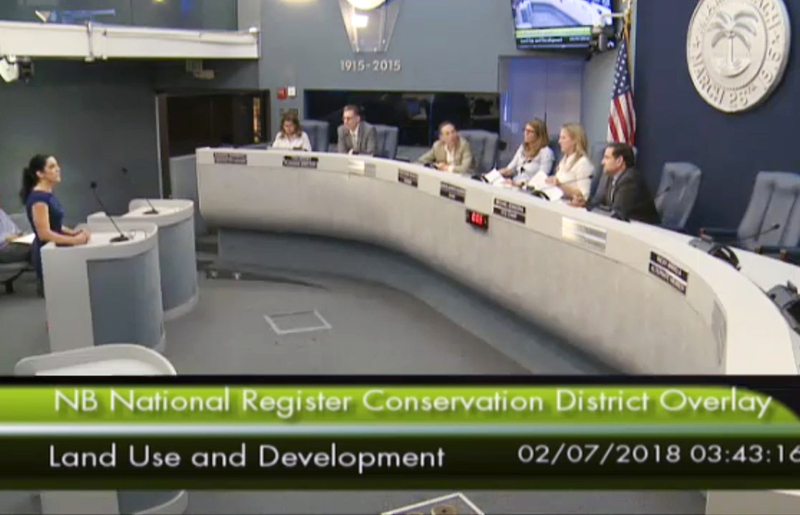 The “missing middle” phenomenon continues in Miami Beach. 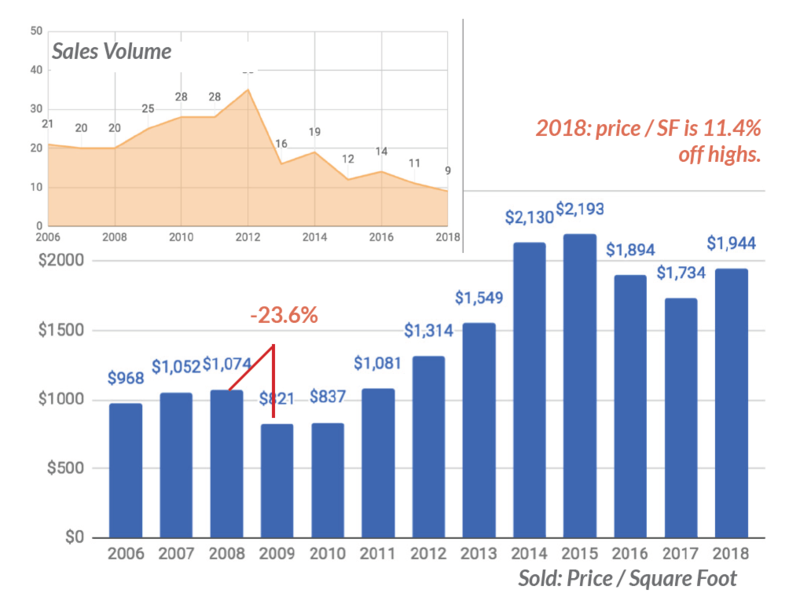 Oceanfront and bayfront luxury condos are selling below 2013 price / sq ft levels, sales volume picking up as prices reset. 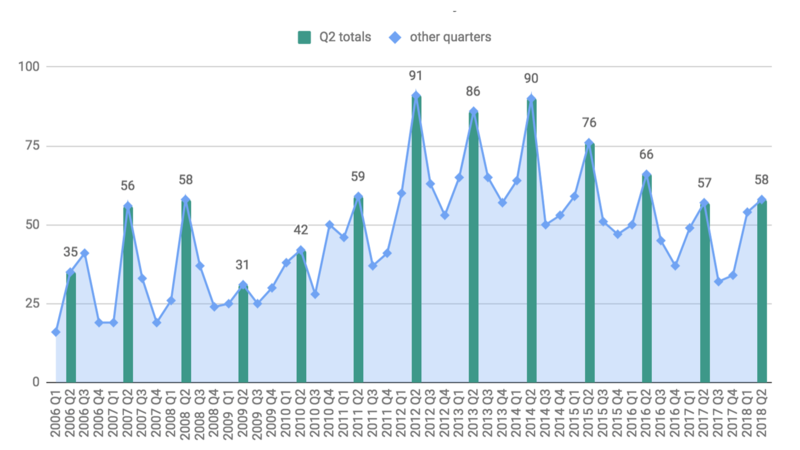 The sales volume decline that began in 2013 appears to have ended in the second quarter of 2018. Higher transaction volume was driven by properties under $500K and over $3M, with the middle ground remaining weak. The second quarter saw a record number of $3M+ condo sales, as high-end properties began to trade at large discounts. 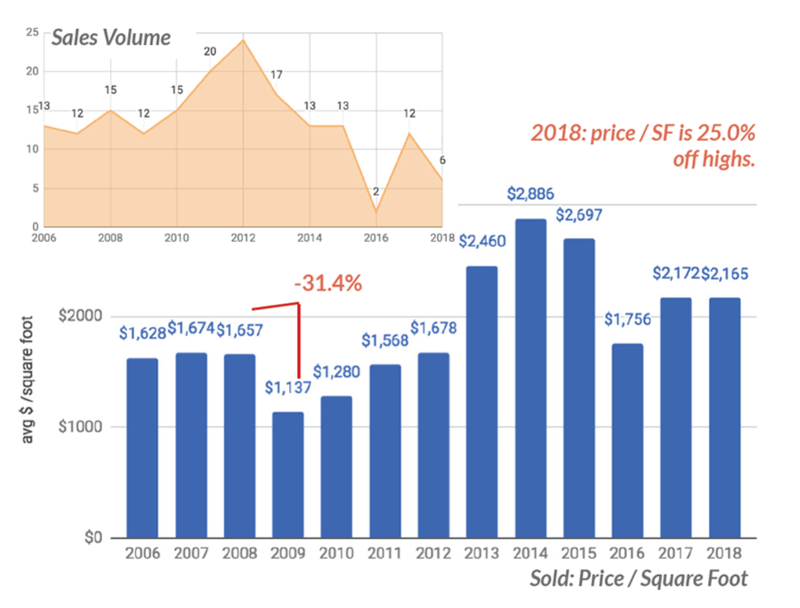 Premiere oceanfront property has intrinsic value, and there will always be buyers at realistic prices - it's now clear that the handful of 2015 and 2016 sales near $3000/sqft did not reflect intrinsic value, but the top of a hype cycle. As for who is buying now, US residents rather than foreign buyers are prominent, such as hedge fund managers moving from high-tax states. Cliff Asness of AQR Capital Management has made the most expensive purchase year-to-date, paying $26M for the penthouse at 321 Ocean. That property sold for 50% off of its original asking price. Miami Beach condo sales volume rose 9.8% from Q2 2017. 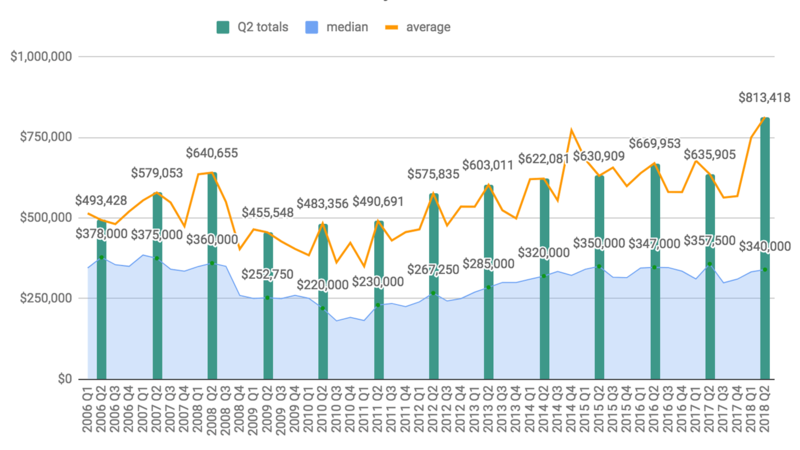 First break in transaction volume decline since 2013, due to increase in sub $500K and $3M+ sales. First break in transaction volume decline since 2013. 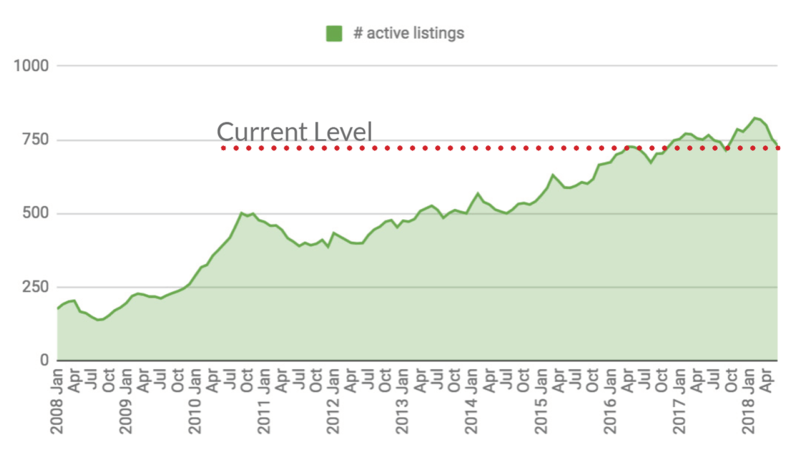 Gains due to sales uptick in the $250K -$499K and $3M+ price ranges. 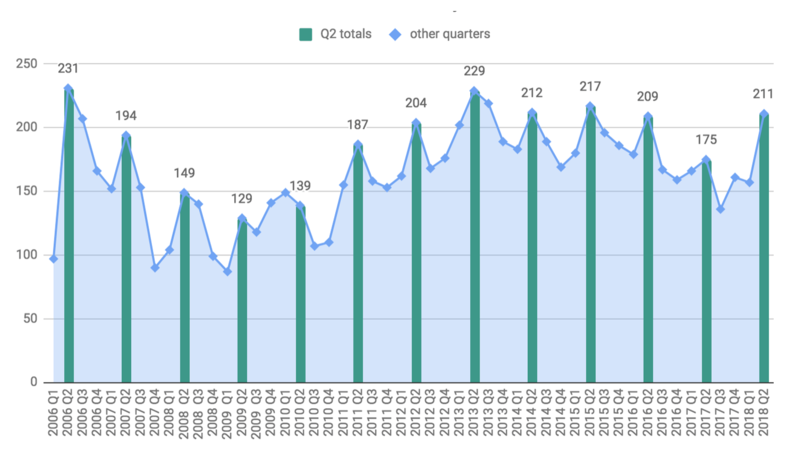 Q2 2018 transaction volume is equivalent to Q2 2010. 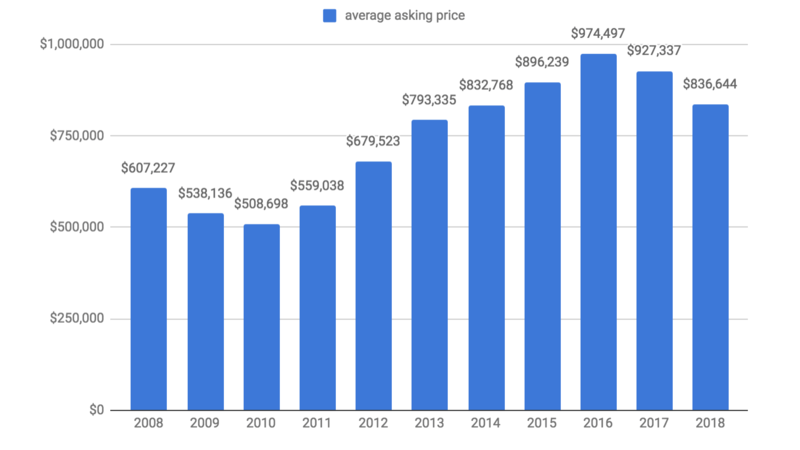 Average price spiked up do to record volume in the $3M+ price range. Average prices are boosted by new construction, many existing buildings are trading below 2013 prices. The Average Asking Price For A Miami Beach Condo Drops To 2014 Levels As High-End Condos Sell At Steep Discounts. 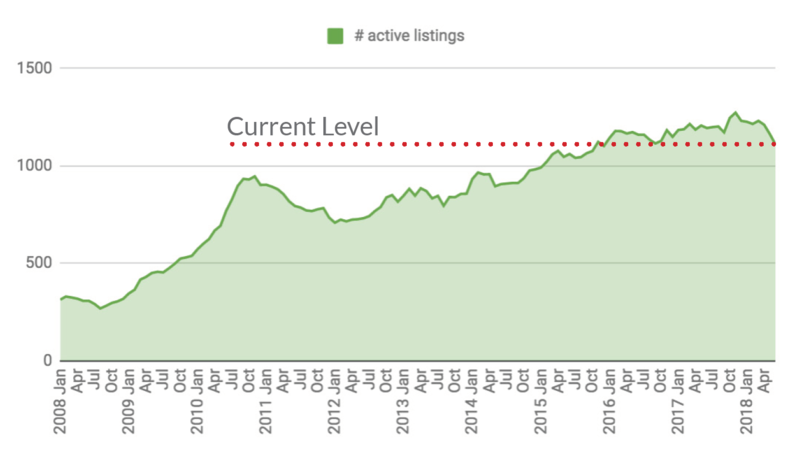 The aggregate value of all actively listed properties dropped, indicating that high-end inventory is finding buyers as prices drop to pre 2014 levels. Miami Beach Condos Aggregate Value Of All Listings. 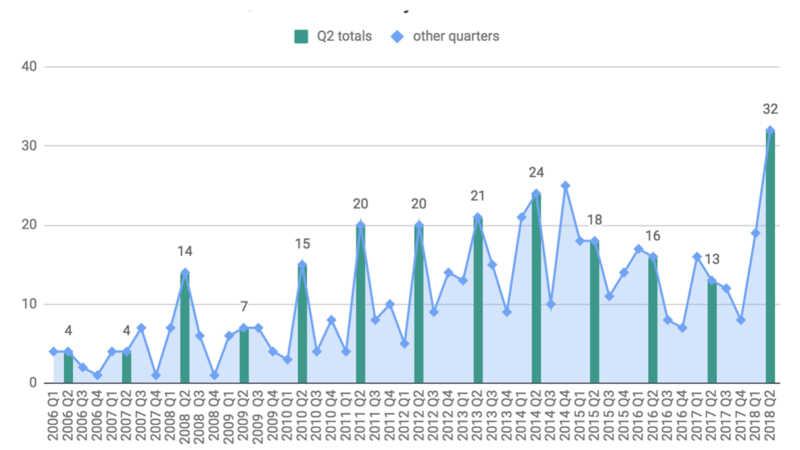 Charted monthly through June 30, 2018. 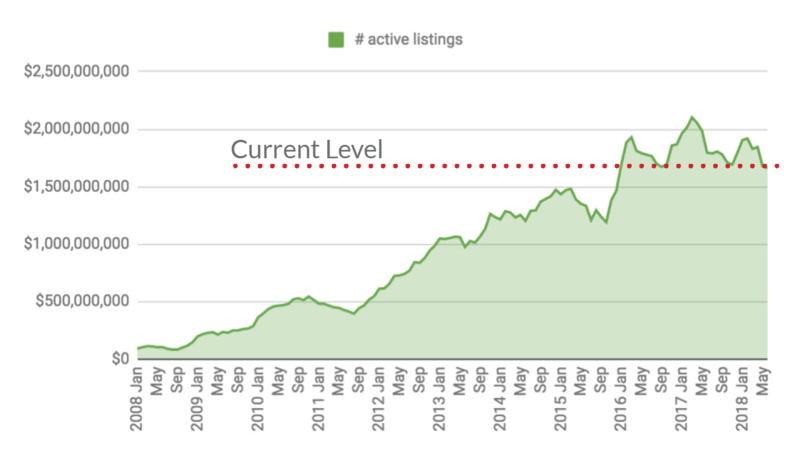 High end condo inventory is starting to clear as prices adjust, middle is languishing. Miami Beach Condos, $250K - $499K. Year-over-year: 21% increase in transaction volume. Miami Beach Condos Active Listings: $250K - $499K. Charted monthly through June 30, 2018. Year-over-year: 10.6% decrease in transaction volume. 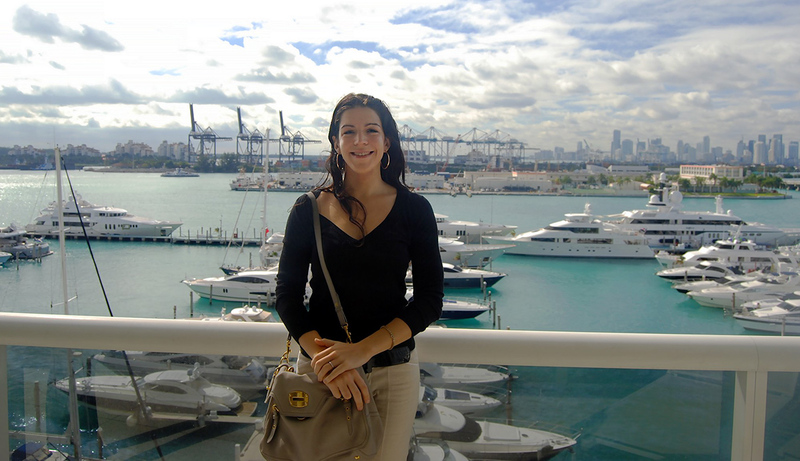 Miami Beach Condos Active Listings: $500K - $999K. Charted monthly through June 30, 2018. Year-over-year: 2% increase in transaction volume. Miami Beach Condos Active Listings: $1M - $2.99M. Charted monthly through June 30, 2018. Luxury, waterfront inventory is starting to clear as prices per square foot dip below 2013. Oceanfront has intrinsic value, and this segment of the luxury market is outperforming mainland locations. 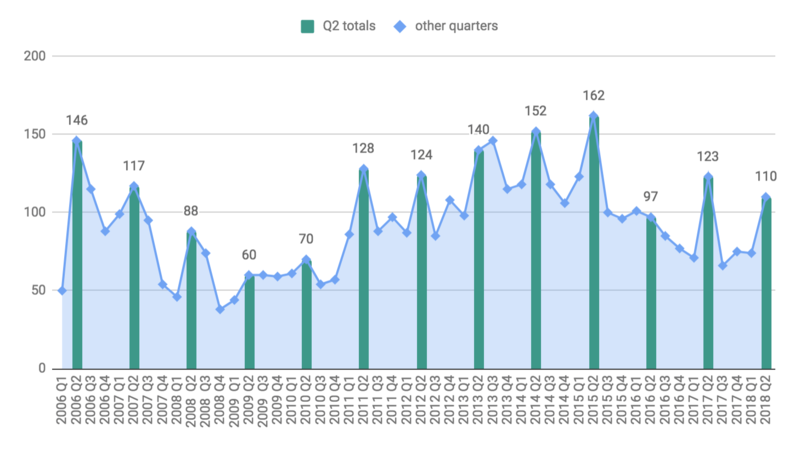 Year-over-year: 246% increase in transaction volume. 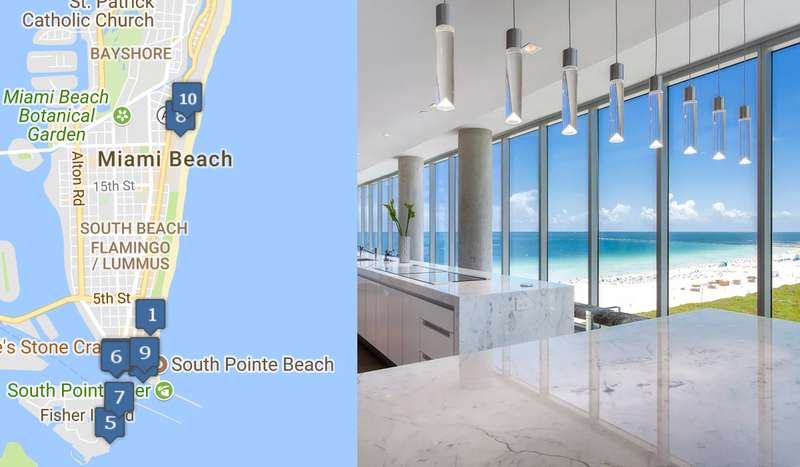 Miami Beach Condos Active Listings: $3M+. Charted monthly through June 30, 2018. Asking prices for luxury Miami Beach condos are dipping below 2013 levels. 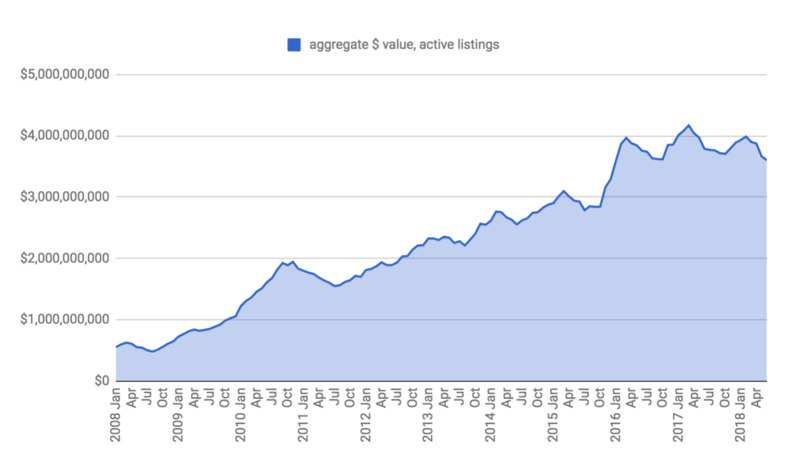 Sales volume is starting to pick up as the market resets. 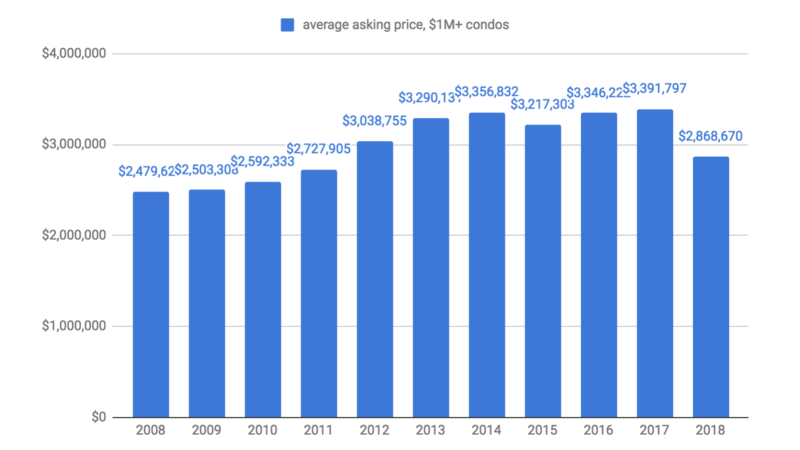 Miami Beach Condos $1M+ : average asking price of active listings. 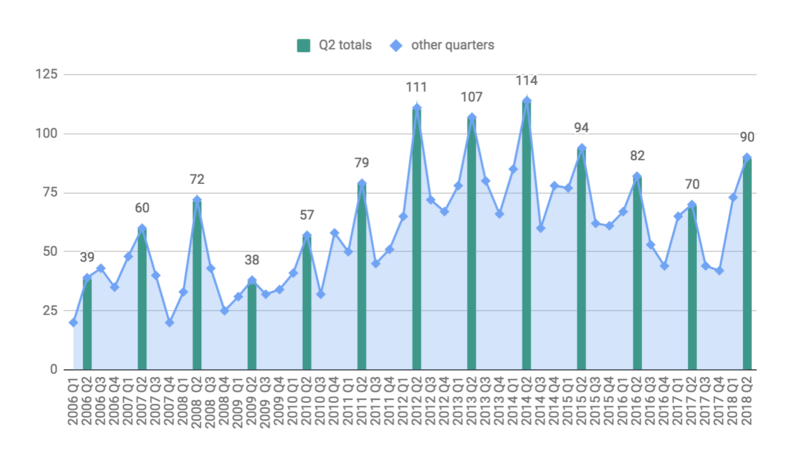 Annual averages, 2018 is through Q2. 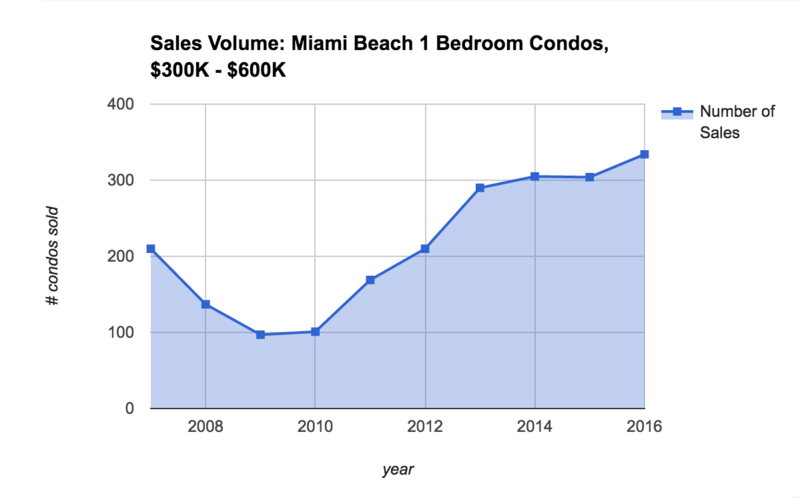 Miami-Dade Condos $1M+: sales volume. Case Study: Luxury Oceanfront Condo Buildings - uptick in sales as units sell at pre 2014 and pre 2013 prices. Continuum South Tower, 100 South Pointe Drive, Miami Beach. Contact me for opportunities in Miami real estate. I will never spam you or share your information. I promise. 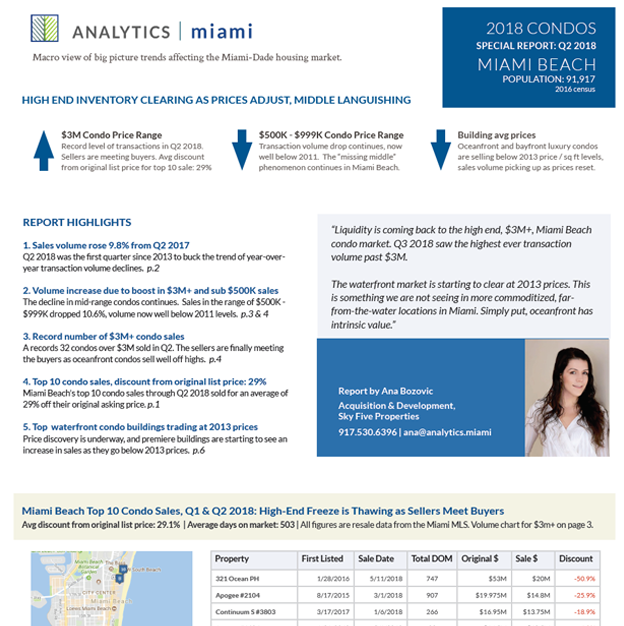 2018 Q1 & Q2: The top 10 Miami Beach condo sales ranged from $8.7M - $26M. The second quarter saw a record number of $3M+ sales, as buyers negotiated significant discounts. The top ten sales averages a 29% discount off of their original list price and took an average of 503 days to sell. Post has interactive map and table. 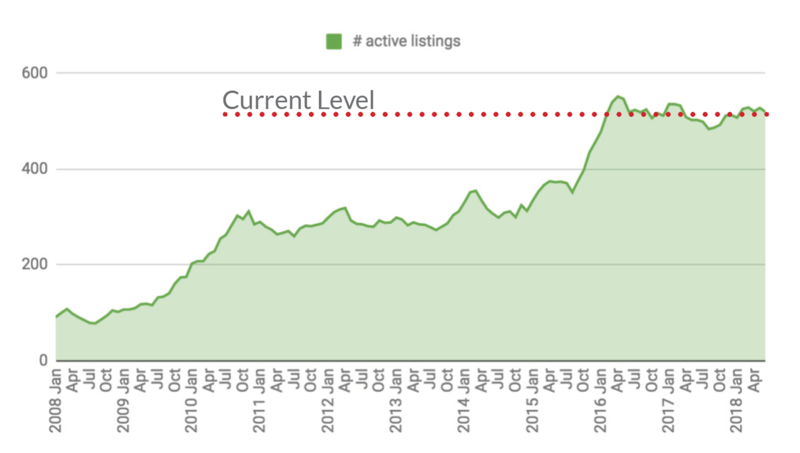 Interested in receiving my bi-weekly Miami real estate market analysis? The market is always on the move and there is money to be made - you just need to know where to look.